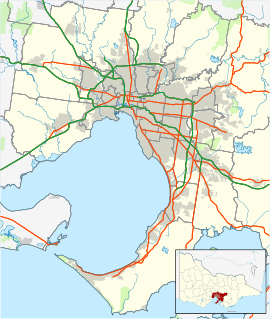 Beaconsfield is a suburb of Melbourne, Victoria, Australia, 40 km south-east of Melbourne's Central Business District, located within the Shire of Cardinia local government area. Beaconsfield recorded a population of 6,714 at the 2016 Census. The area was named after Benjamin Disraeli (Lord Beaconsfield). Beaconsfield Post Office opened on 7 October 1878 and the original weatherboard building still stands as the "Corner Post Café"; Beaconsfield Railway Station Post Office opened on 1 January 1883. In 1891 Beaconsfield was renamed Beaconsfield Upper and around 1902 Beaconsfield Railway Station was renamed Beaconsfield. The suburb has a small shopping centre "Beaconsfield Shopping Plaza" with shops such as an Aldi and Woolworths, bakery, chemist, many cafés and a fish and chips shop. Schools include Beaconsfield Primary, and St Francis Xavier College (Beaconsfield Campus). There are many cafés and hairdressers around the commercial shopping area. The Beaconsfield CFA (Country Fire Association) has their fire station in Woods Street, which was built in 2016. The town has an Australian Rules football club and a netball club that compete in the South East Football Netball League, which was where football stars Brendan Fevola, Chris Newman, Tim Barker and Austinn Jones formerly played. There is also a cricket club and a tennis club. Shire of Pakenham - Beaconsfield was previously within this former local government area. ^ Australian Bureau of Statistics (27 June 2017). "2016 Community Profiles: Beaconsfield (State Suburb)". 2016 Census of Population and Housing. Retrieved 2017-09-16. This page was last edited on 28 December 2018, at 01:28 (UTC).